While statins work in the liver, Welchol is a treatment that goes to work in your intestines, lowering both your LDL (bad) cholesterol and your high blood sugar (A1C) levels. The way Welchol lowers blood sugar is unknown. 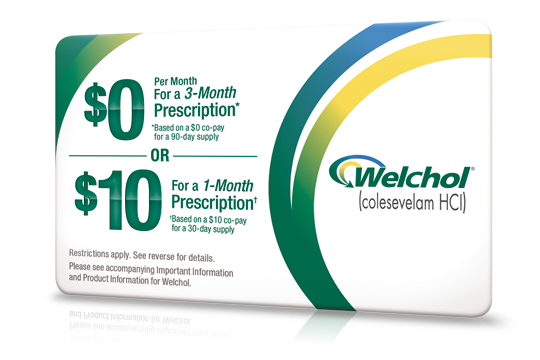 What is Welchol® (colesevelam HCl)? Welchol, along with diet and exercise, lowers LDL or "bad" cholesterol. It can be taken alone or with other cholesterol-lowering medications known as statins. Click here for Full Product Information for Welchol. 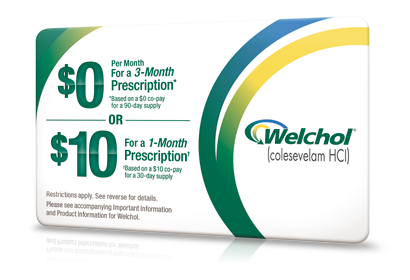 Welchol® (colesevelam HCl) lowers "bad" cholesterol differently from statins. While statins work in your liver, Welchol works in your intestines. It's a "bile acid sequestrant" indicated to lower LDL or "bad" cholesterol. Bile acids are needed to help digest fat from the foods we eat. Welchol attaches to bile acids and removes some of them from the body. When levels are reduced, your liver needs to make more. Your liver takes cholesterol from the bloodstream to do so—lowering your "bad" cholesterol. Welchol also lowers your A1C. It's not known exactly how it does this, but studies have shown that, when added to metformin, sulfonylurea, or insulin therapy, Welchol helped significantly lower A1C levels in adults with type 2 diabetes. Welchol may increase blood levels of metformin when taking in combination with metformin extended release (ER). Check with your doctor about monitoring your blood sugar levels. Welchol is not for everyone, especially those with intestinal blockage, those with blood triglyceride levels of greater than 500 mg/dL, or those with a history of pancreatitis (inflammation of the pancreas) due to high triglyceride levels. Ask your doctor if Welchol is right for you. Please see Important Safety Information about Welchol below. Ask your healthcare professional to check your lipid levels, including trigylceride and non-HDL cholesterol levels, before starting Welchol and periodically thereafter. With Welchol, you may start seeing some results in as little as 2 weeks. Stay on Welchol to see continued clinical benefits. Keep moving forward with Welchol. Welchol is not right for everyone. Ask your healthcare professional if Welchol is right for you.